There was a recent devaluation of their points so that their true value is about 4.2%. You can read about it on FatWallet. Bank of America Cash Rewards 3.3% Cashback at gas stations. 3% at gas stations, but you will get a 10% bonus on any rewards redeemed into a Bank of America checking account. A reader, JF, pointed me to a credit card which I didn't know about that is even better for some people. 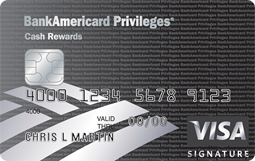 Introducing the Bank of America Privileges Card. It is the same 3% back at gas stations, but instead of a 10% bonus into a Bank of America checking account, you will get a 50% bonus! That is effectively getting 4.5% cashback on gas purchases! The card is open to all, but unless you have $50,000 with Bank of America or its Affiliates (includes Merrill Lynch), there is a $75 annual fee the second year. The annual fee is waived every year if you have $50,000 with them. I would not get the card unless you already have $50,000 with Bank of America that you aren't planning on moving. The extra 1.5% is not worth the $75 annual fee. Your base rate of 3% doesn't change, all the changes is your bonus. Therefore, any rewards you have built up before you switch to the privileges card should be redeemed at the higher 4.5% rate. If you already have a Bank of America Cash Rewards card you can call up and have your card automatically switched into a Bank of America Privileges card.